Delaware State Park has several dock lengths currently available for rent. For more information regarding dock rentals, please contact the Alum Creek park office at 740-548-4631. 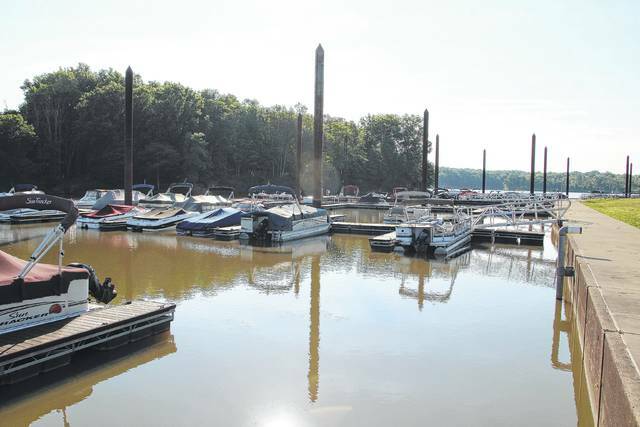 The Ohio Department of Natural Resources has seasonal dock vacancies which are available for rent several Ohio State Parks. Delaware State Park has several dock lengths currently available for rent: 32 28-foot docks, 12 24-foot docks (four of which are ADA accessible), and 25 16-foot docks. Delaware Lake’s 1,215 acres of water offer excellent boating and fishing opportunities. There are three launch ramps placed conveniently around the lake and a fully-equipped marina that offers fuel, fishing and boating supplies. For more information regarding dock rentals, please contact the Alum Creek park office at 740-548-4631. Grand Lake St. Marys State Park currently has 133 docks available for rent. The popular 13,500-acre lake offers unlimited horsepower and nine state-operated launch ramps. Interested boaters should contact the Grand Lake St. Marys park office at 419-394-3611. Buck Creek State Park currently has 70 docks available for rent. Located in Springfield, the 2,120-acre reservoir offers a four-lane launch ramp and a marina, which supplies fuel, snacks and bait. Interested boaters should contact the Buck Creek park office at 937-322-5284. Cowan Lake State Park currently has 26 docks available for rent. Sailing is very popular on the park’s 700-acre lake. The lake has a 10-horsepower limit and four launch ramps. Interested boaters should contact the Cowan Lake park office at 937-382-1096. Lake Loramie State Park currently has 16 docks available for rent. Located in Minster, this 407-acre lake is a Certified Clean Marina and offers six launch ramps. Interested boaters should contact the Lake Loramie Park Office at 937-295-2011. Paint Creek State Park currently has 37 docks available for rent. Located in Bainbridge, this 1,190-acre lake features a certified Clean Marina and offers three launch ramps. Interested boaters should contact the Pike Lake park office at 740-493-2212 or Rocky Fork park office at 937-393-4294. Rocky Fork State Park currently has 220 docks available for rent. The 2,080-acre lake offers six launch ramps and designated areas for boat camping and swimming. Interested boaters should contact the Rocky Fork park office at 937-292-4284. Hueston Woods State Park currently has 38 docks available for rent. The 625-acre Acton Lake offers excellent opportunities for boating, paddling, fishing and swimming. Interested boaters should contact the Hueston Woods park office at 513-523-6347. Mosquito Lake State Park currently has 67 small docks available for rent. Located in Cortland, the lake offers an outstanding 7,850 acres of unlimited horse power boating and five launch ramps. A fully stocked marina is located on the south end of Mosquito Lake and offers marine supplies, fuel fishing equipment, snacks and beverages; it is a certified Clean Marina and has a life jacket loaner board. For more information, please contact the Mosquito Lake park office at 330-637-2856. West Branch State Park currently has 25 20-foot docks available for rent. Located in Ravenna, the 2,650-acre lake is extremely popular with fishermen, boaters and swimmers. There are five launch ramps and two boat-swim areas. The marina is located on the east side of the lake and offers boat supplies, gasoline and snacks; it is a certified Clean Marina and has a life jacket loaner board. For more information, please contact the Lake Milton park office at 330-654-4989. The ODNR Division of Parks and Watercraft is responsible for managing Ohio’s 74 state parks and providing the finest outdoor recreational opportunities, including first-class boating services, facilities and law enforcement for users of Ohio’s waterways and public lands. https://www.delgazette.com/wp-content/uploads/sites/40/2017/06/web1_DOCK-RENTALS.jpgDelaware State Park has several dock lengths currently available for rent. For more information regarding dock rentals, please contact the Alum Creek park office at 740-548-4631.